Half past noon, the famous airplane “slipped through Hellgate Canyon into Missoula. (The pilot) circled the business district so low that the name of the ship and the letters on the wings were plainly visible. 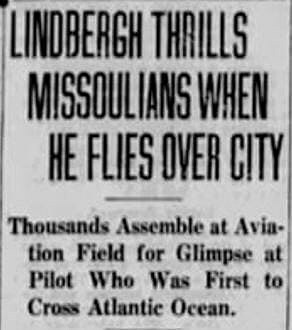 “On every street in Missoula, youngsters squealed with delight and wonderment,” reported the Missoulian newspaper, as Colonel Charles Lindbergh’s “Spirit of St. Louis” flew over every part of the city, swooping down, darting up and banking sharply, before heading toward the airfield at Fort Missoula. Thousands of folks had gathered there hoping not only to catch a glimpse of the famous aviator, but that he might make an unscheduled stop. Lindbergh “roared close to the ground just above the heads of the throng,” then gained altitude and dropped a canvass packet with a yellow silk streamer attached. Inside was a message apologizing for not being able to land in Missoula, citing the “limited time and the extensive itinerary” of his U.S. tour promoting the expansion of commercial aviation. He smiled and waved a final time to the crowd below, then headed west toward Spokane. 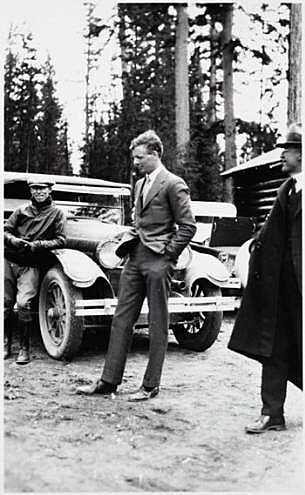 But Charles A. Lindbergh left his mark on Montana – a mark that remains to this day. The aviator initially arrived in Montana September 6, 1927, landing at Butte. 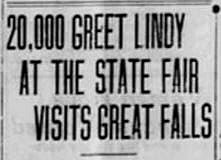 The next day he flew his famous plane to Helena where he was greeted by a crowd of 20,000 at the state fair. A reporter described Lindbergh as looking “worn and tired,” but able to break into “his famous smile” as he addressed the throng. That same day he flew north toward Canada, viewing Glacier National Park, and along the way spotted a beautiful lake in the wilderness. He circled a number of times, and when he arrived back in Butte, showed the spot on the map to the mining executives, who were serving as his hosts. They quickly identified the location as Elbow Lake, and Lindbergh, exhausted from his air tour, asked them to arrange a fishing and camping trip so he could have a few days of relaxation. The party set out by car Thursday morning, September 8, 1927, arriving at Seeley Lake about seven hours later where they had lunch at C. H. McLeod’s summer home. McLeod was the president of the Missoula Mercantile company. From there, they traveled by pack train to Elbow Lake, “one of the most rugged and picturesque spots in the entire West, a region, the virginity of which is yet unspoiled by the automobile. At the lake, Lindbergh spent considerable time with “Cap” Laird who, with his wife, Clementine, had begun setting up a dude ranch called “Laird’s Lodge.” At the time, though, it wasn’t much of a lodge – more a series of tents set up along the shore. “Cap” and Charles went fishing and boating together as well as spending time shooting at clay targets. The experience, and Elbow Lake, made an indelible impression on Lindbergh. Later in his life, the aviator turned his interest to conservation and along with his son, Land Lindbergh, raised money to help create the University of Montana’s Lubrecht Experimental Forest near Missoula. Land and his family settled on a ranch in the Greenough Valley and over the years Charles would return to visit, but always quietly, with no fanfare. Most times, local folks never knew he was at his small cabin on the Blackfoot. But, it was that lake – that little lake in the mountains – that was always the connection between Lindbergh and Montana. Reporter Sherry Devlin recalled the attraction of the lake in a 1998 newspaper article: “Early in the day, (the lake’s) waters are finely wrinkled, green from the reflection off the timbered hillsides, silent save the hum of a single, small aluminum boat. If you would like to visit the area, don’t set your GPS for Elbow Lake. Enter the name, “Lindbergh Lake,” the moniker it’s had ever since that visit by the famous aviator back in 1927.